Seventeen kidneys of beagle dogs received 2,000, 3,000, or 4,000 shock waves with the Wolf Piezolith 2200. Stone material had not been previously implanted in the kidneys. Computed tomography (CT) findings within the first 24 hours after treatment showed wedge-shaped enhancements of contrast medium in the shock wave channels (paths of shock waves through the kidneys). Later CT examinations showed no pathological alterations in the same areas. 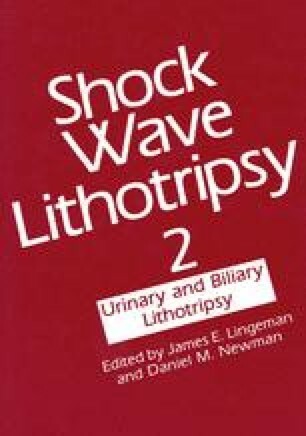 Histological examinations one day after treatment showed alterations in the kidneys, the degree of alteration depending on the number of shock waves administered. At this examination intrarenal hematomas and papillary necrosis were seen, but perirenal or subcapsular hematomas were not. Damage to vessels was found in small and mid-sized veins and arteries. Seven and 14 weeks after treatment the extent of residual damage was small in comparison to early renal damage. Two patterns of lesions were observed: a cord-like scar at the corticomedullary junction and a wedge-shaped defect of the papillary apex. In none of the kidneys examined histologically could changes in veins or arteries be detected at seven and 14 weeks after treatment.